Must have addition for Metal and Element collectors, alike. Have we just seen gold and silver selling for bargain basement prices for the last time? The Cypriot banking rescue/fiasco could be a major turning point. Leave your money in the bank and see it erode or pillaged. With the Cyprus saga unfolding banks are seen with even more suspicion. The Zim situation: One day, your million bucks in the bank is able to buy you a skyscraper, the next day, that money can't even buy a loaf of bread. So what's a safe Haven for your money. There is the Russian and Turkish option of buying gold and silver in small quantities if AVAILABLE, or the German option of buying jewellery. When paper money as we know it, crashes, bartering will take over as happened in Greece and historically in Argentine. But even bartering has it's shortcomings, still requiring some sort of currency. This will usher in the currencies of old, gold and silver, making both forms rare. Other rare metals will follow suit and certain ones such as Gallium while being rare, will in future, be even rarer and appreciate in value, even faster than silver and gold. 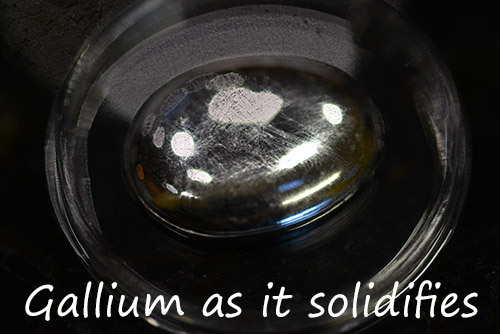 Gallium is easy to test for authenticity thus making it a viable, alternate currency, now and in the future. 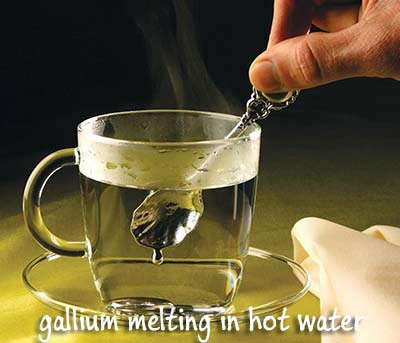 The unique melting point of gallium (29.7646 °C) allows it to melt in one's hand, thus enabling one to check for authenticity and purity and then solidify when removed. * It can be fun simply observing gallium solidifying. A small crystal, or several crystals will grow inside the gallium, that take on a blueish hue, and slowly grow until everything has solidified. 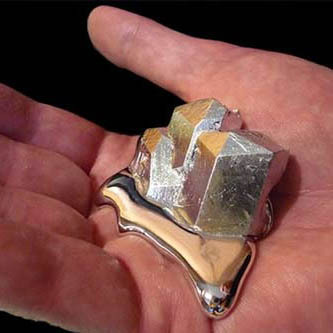 * Feel the odd sensation of touching a liquid metal without the toxic properties of mercury. 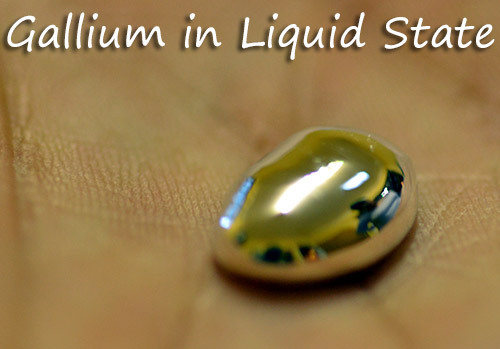 * Gallium readily coats many surfaces; create your own mirrors by applying a thin layer of gallium to a glass surface.